Earlier this year, you may recall that we wrote about a bizarre and ridiculous lawsuit that luxury goods retailer Louis Vuitton had filed against Hyundai, because for a couple of seconds in a Hyundai commercial, a basketball is seen with markings that sorta kinda mimic (though, not exactly) LV's handbag design. 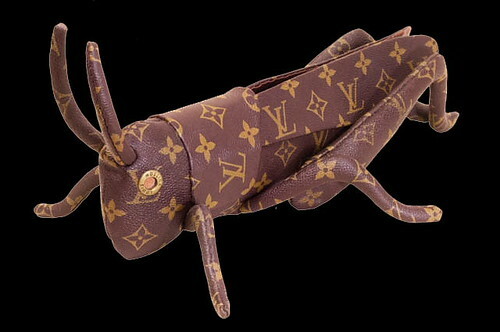 This is the same Louis Vuitton that had sued a fundraiser who had made t-shirts to raise money for Darfur, which included an illustration of a "pimped out" Darfur victim who was holding a bag that also mimicked LV's designs. I was reminded of both of these cases recently when I was catching up on recent episodes of the TV show Mythbusters. In one episode, the myth being tested is whether or not you can build a cannon out of leather. 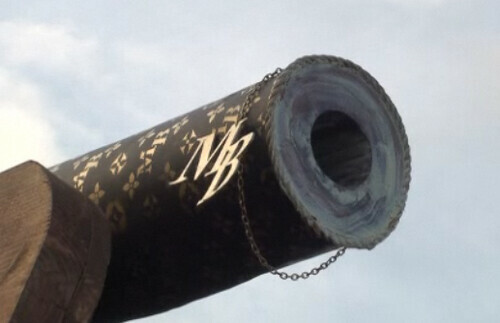 In the final attempt, Mythbuster Kari Byron decides to "decorate" the cannon, and does so with symbols that, again, mimic the LV design, turning it into a "designer cannon." Unfortunately, it looks like Discovery doesn't let you embed clips (why, Discovery, why? ), but here's a quick screen shot that I took: All I could think of was whether or not (a) Mythbusters/Discovery had cleared that and gotten a license from LVMH or (b) if LVMH was going to sue. I have no idea if anything has happened there, but you can rest assured that LVMH is busy on the legal front elsewhere. a play on the words batta ("locust") and battamon (slang for "knockoff"). According to the artist, the works are meant to raise questions about the relationship between authenticity and imitation in a consumer-driven society. This is extremely shocking to me. Typically, putting something under the umbrella of "Art" keeps you safe from these sorts of things. some examples: I once attended an art exhibit with computers and CD burners on display, where people were invited to download mp3s, burn them to disk, and take the CDs with them. The show was intended to be a commentary on how people consume music in the digital era. Another example: An artist placed a pile of cocaine in the middle of the gallery, and for the duration of the show, he sat in a corner, blindfolded. people were only allowed to enter one at a time, and if they so wished, they could snort some. I think the show was supposed to be saying something about self-control and surveillance, but I did not attend this show, I only read about it after the fact. And these shows both went off without a hitch. Under the umbrella of art, these activities were not a problem. The show must go on. So...snorting coke in a gallery is fine, but using some Louis Vuitton logos in your art is a show stopper.